This is a large genus of over 100 species that are mostly palaearctic and associated with Asteraceae. There are several species introduced to North America from elsewhere, plus a handful of native species. It is similar to my favorite genus Macrosiphum, and in fact the fringes of the groups are very difficult place confidently in either genus. I have been lucky enough to study a few interesting discoveries in this group. The first find I made was in graduate school in 1991: I found Macrosiphoniella leucanthemi (Ferrari) in the Cascade Mountains of Oregon living in large numbers on its normal host, Leucanthemum. Many subsequent years of collecting on this plant has shown that M. leucanthemi is very uncommon in North America. 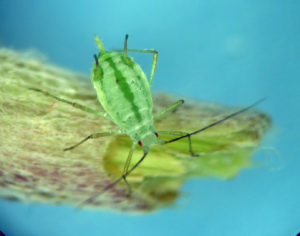 The second was when I lived in Maryland, being the first to recognize Macrosiphoniella (Phalangomyzus) grandicauda Takahashi & Moritsu living on Artemisia vulgaris around the Washington, D.C. area. 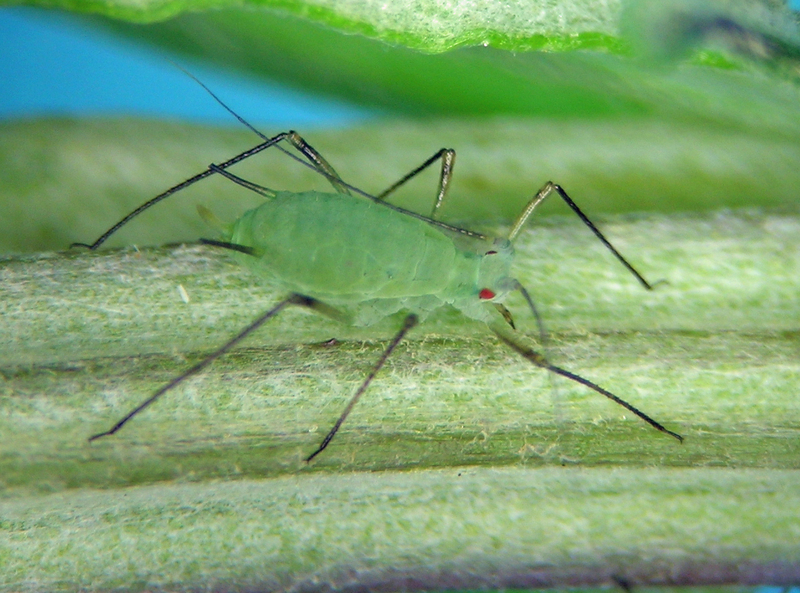 This species was identified at first by noticing a color photograph in a Japanese book about aphids. The third cool discovery is an apparently undescribed species in Oregon and Washington living on Eriophyllum. The latter has an almost impossibly long ultimate rostral segment, making it unique. An apparent fundatrix of the undescribed Macrosiphoniella on Eriophyllum in eastern Oregon. Finally, a couple years ago during a visit to University of California at Davis I found what appears to be Macrosiphoniella (Phalangomyzus) antennata Holman & Szelegiewicz on an ornamental sagebrush shrub. It was abundant on this one shrub, and I did not have the opportunity to search more natural settings in the area to see if was only living on campus. I have photos of only a couple species of Macrosiphoniella so far. I hope to be able to get many good specimens and photos of the undescribed species on Eriophyllum soon, since the plant grows in our back yard. This is one of the few apparently native species of Macrosiphoniella in North America. 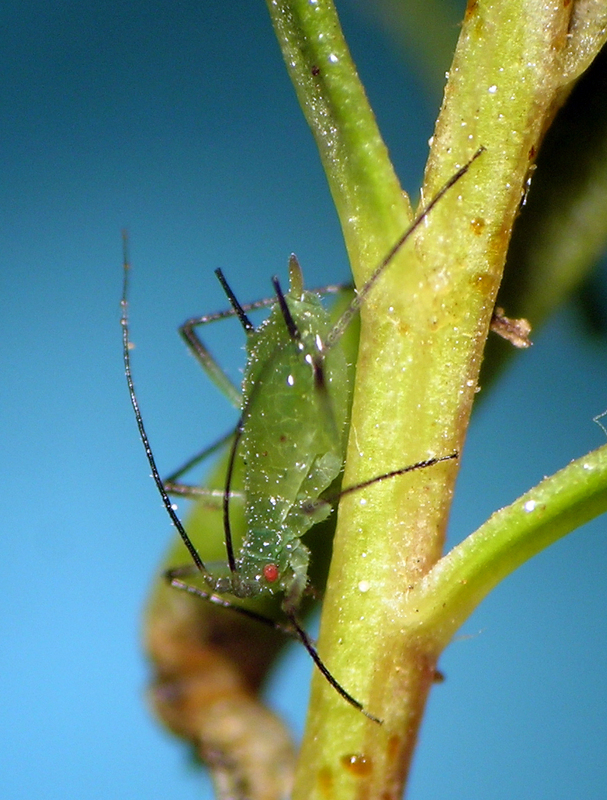 So far, I think I have found this aphid everywhere I have found its host plant, Artemisia dracunculoides. It is a beautiful shiny green, fast moving, and charismatic little insect. I so far have specimens from Washington, Oregon, Utah, New Mexico, and Arizona. Macrosiphoniella glabra from north-central Oregon near McNary Dam on the Columbia River. This is another of the native Macrosiphoniella, and it is frustratingly common on herbaceous Artemisia species almost everywhere I go from ocean coast to alpine meadows and roadsides. Common-ness can be frustrating because every time I get a Macrosiphoniella in a remote natural setting I think maybe this time the sample is something new and interesting; but alas, it is almost always another sample of M. ludovicianae. I have collected samples in British Columbia, Washington, Oregon, California, Idaho, Utah, Colorado, New Mexico, and I have probably seen it in other states and walked past it in frustration. Macrosiphoniella ludovicianae from Hells Canyon in May.